Hidden away is an ingenious mechanism that glides open to reveal two extra leaves. 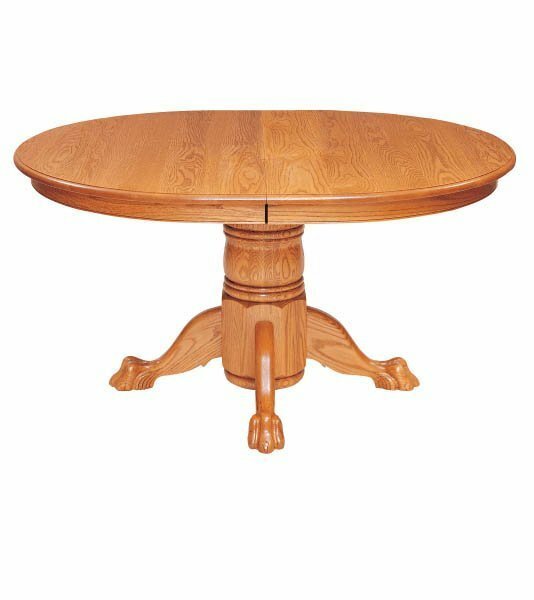 So when guests are coming, this oval pedestal table easily expands. Closed, it’s perfect for four. Comfy arrow back chairs encourage lingering for dessert and coffee. Each pieces of furniture in the Keystone Collection is a classic expression of the woodworker’s art. Shown in Solid Oak Wood with a Honey Pine Finish. Clearance from floor to skirt: 26-3/8"
*Locally Sourced Hardwoods - The hardwoods used to craft your table are sourced from a responsibly managed local forest. *Grain Matching - Hand matching wood for grain and color on the skirting of tables accentuates the true beauty of visual unity and fine craftsmanship. *Geared Slides - Our pedestal tables allow one person to easily expand the table when extra leaves are added. *Mitered Cut Skirting - Unique dovetail joinery ensures that the skirting corners will not gap open, even after many years of use. *Personalization - The personalization will read: "Especially for the "Customer Last Name" Family. Shown in Solid Oak Wood with a Honey Pine Finish.